Coral Richardson co-captained three sports as a 1975 Bristol Eastern graduate, volleyball, basketball and softball. While at Bristol Eastern her basketball team was state runners-up in 1974. She went on to play four years of varsity volleyball and basketball at SCSU, and one year of softball. The 1977 volleyball team won the New England championship and the 1977 basketball team was ranked 5th in the nation. 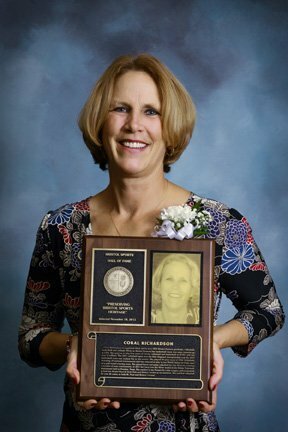 She played 30-plus years of USA Volleyball, including 18 national tournaments and was selected to play in two World Games in Utah, once on a gold medal-winning team. She played beach and grass volleyball for over 20 years, winning a number of state tournaments. In 2011 her team won the Silver medal in the Senior Nationals tournament held in Houston, Texas. She coached in the Forestville Little League, girls basketball at both the Bristol Boys & Girls Club and Bristol Central as an assistant. She coached volleyball for over 20 years, at both St. Paul and Bristol Central. In 2017 she was chosen to represent the United States as a member of the World Masters Volleyball games in New Zealand.